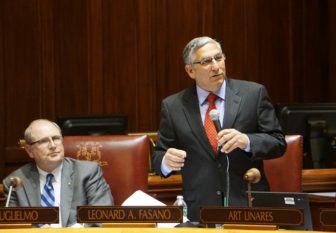 Sen. Kevin Kelly listens to Len Fasano, the GOP leader, make his closing argument about the Republican budget proposal. Senate Republicans used the final night of the 2017 session to make a political statement, forcing a debate on their budget plan, which would dramatically reshape Connecticut’s labor laws. The $39.5 billion, two-year budget measure was tabled after a two-hour debate. And while Republicans argued legislators must accept overdue structural changes to counter spiking retirement benefit costs, Democrats countered the GOP plan would do more harm than good. The caucus’s budget for the next two fiscal years would close projected shortfalls of $2.3 billion in 2017-18 and $2.8 billion in 2018-19, potential gaps of 12 percent and 14 percent, respectively. Calling concessions recommended by Gov. Dannel P. Malloy and state employee union leaders insufficient, the Senate GOP offered several ideas to tighten labor laws for larger savings in wages. 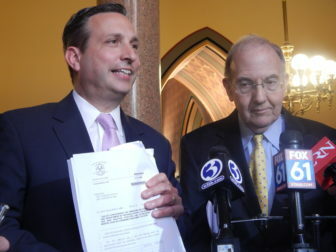 Fasano estimates Connecticut could save nearly $1.95 billion over the next two fiscal years — $348 million more than Malloy’s concessions’ plan anticipates. “This, of course, is yet another act of political theater on their part,” Senate President Pro Tem Martin M. Looney, D-New Haven, said a few hours before the debate. Looney, who has called the plan an “attack on labor,” has said Senate Democrats believe the savings the GOP is seeking should be achieved through negotiations with labor, a position echoed by House Speaker Joe Aresimowicz, D-Berlin, and Malloy. The Democratic governor and union leaders announced a tentative concessions framework last month. But in return for those concessions, the state would extend its worker benefits contract — which otherwise would expire in 2022 — until 2027. Unions that grant wage concessions also would be largely exempt from layoffs through the 2021-22 fiscal year. And with analysts warning public-sector retirement benefit costs are likely to surge for the next 15 years or more — due largely to insufficient savings efforts over the past eight decades — Republicans said taxpayers are being overwhelmed and Connecticut’s economy is being damaged badly. But Democrats countered the Republican plan does not match the Republican rhetoric. Sen. John Fonfara, D-Hartford, noted that a half-dozen Republican senators claimed the plan does not raise taxes or referred to the need not to burden cities and towns. Yet the GOP budget would reduce municipal aid by about $90 million next fiscal year, with the largest cut involving a program to share sales tax receipts with cities and towns. The plan also would raise taxes and fees by $64 million next fiscal year while delaying another $25 million in previously approved tax cuts. The largest tax increase in the Senate Republican plan involves restricting the property tax credit within the state income tax system to households with dependents. This would cost middle-income families an estimated $55 million per year. It also would scale back an income tax credit for the working poor, which would cost those income tax filers about $25 million annually. The plan also includes reductions in taxes on estates and insurance companies, and expands the income tax exemption on Social Security benefits. Sen. Cathy Osten, D-Sprague, said the Republican plan would cut more than $100 million in funding from the University of Connecticut and the UConn Health Center, questioning whether this would drive up tuition and fees and discourage efforts to grow Connecticut’s talented worker base. “I wonder if you think poor people should not go to the University of Connecticut?” Osten said. Democrats and Republicans in the Senate agreed beforehand to limit the budget debate to two hours. At that point, a motion to table the measure initially deadlocked 18-18 along party lines. But Lt. Gov. Nancy Wyman, a Democrat and Senate president, cast the tie-breaking vote in favor of tabling the measure.